On the theory that a whole bean coffee will be better than an equivalent ground coffee, I took this $3.99 journey. It’s sad to say that the journey disproved the theory. This coffee ranks down near the bottom of our coffee ratings with its brothers and sisters on the ALDI coffee shelves. There was not very much of a coffee smell on opening the package. 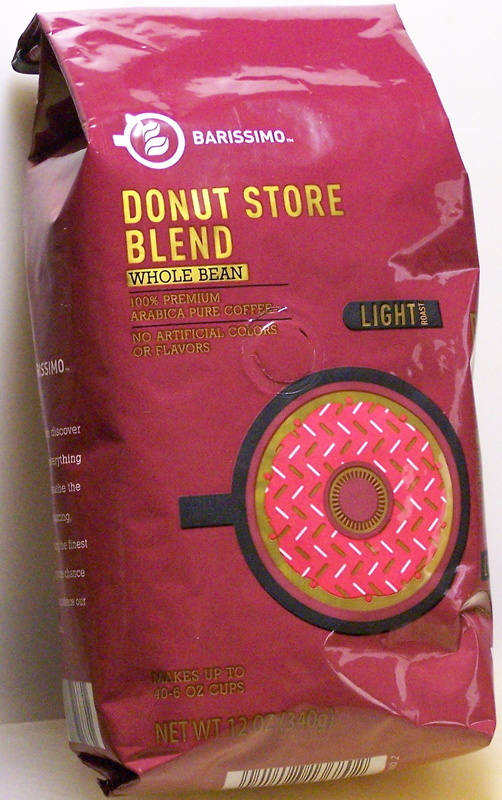 For a coffee labeled light roast, the beans had the nonuniform appearance of somewhere between a medium and dark roast. After grinding the beans and adding hot water, the aroma didn’t improve much. It was actually sort of an aroma on the bad side. Using a timed 4 minute brew, the color of the brewed coffee was surprisingly on the light side versus what one might expect from the color of the beans. Taking the first sip, the coffee was a little watery with a neutral to not so good taste. There was a lingering bitterness after the coffee left the mouth. A few sips later (and a cup that had cooled slightly), the taste became more palatable and the bitterness became less noticeable. Overall, this is not a very satisfying coffee. For the second day of tasting, a few more beans in the grinder solved the watery coffee problem, but raised the bitterness level. Well that didn’t work. So on to the ultimate salvation for not so good coffee, a bit of Irish cream and a squirt of whipped cream. That pretty much hid the bitterness of the coffee and after a few more sips, . . . I didn’t really care. This entry was posted on 12/16/2014 at 08:37 and is filed under ALDI, food, Recipes, food, cooking and related items. You can follow any responses to this entry through the RSS 2.0 feed. You can leave a response, or trackback from your own site. You put my thoughts about this coffee in perfect words. Thank you!